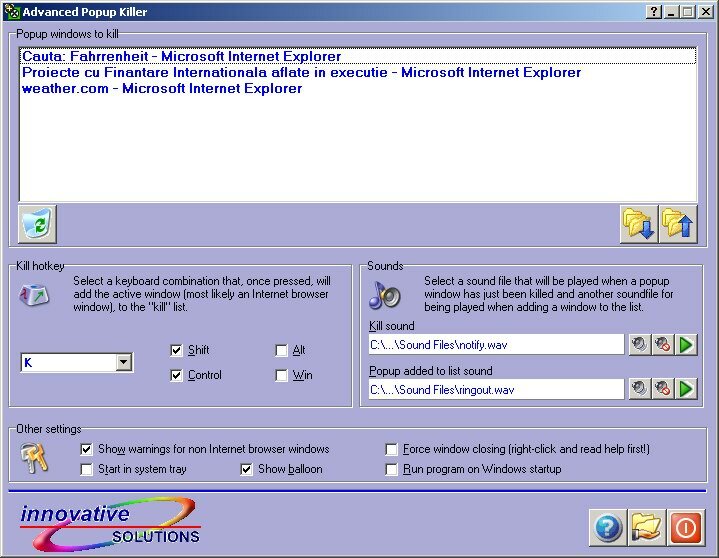 Advanced Popup Killer is a Windows-based shareware for closing unwanted popup windows while surfing the web. You can choose a keyboard shortcut, and after using it on an active Internet browser window, it will be closed each time it appears again. Now you can easily use Advanced Popup Killer on several computers - since it can export / import it's black list!Also you can activate special sound signals for above-listed actions. The program has a very simple principle of operation. When you are surfing the Internet and unwanted pop-up advertisement appears press a defined hotkey combination for adding it into special blocking list and next time it will be automatically closed. If you added any window into the blocking list by a mistake and dona�?t want to block it anymore then you can easily exclude it from the list using the program's main window. Here you can also define a hotkey combination and customize other features of this application. Also you can activate special sound signals for above-listed actions. Advanced Popup Killer is a Windows-based shareware for closing unwanted popup windows while surfing the web. You can choose a keyboard shortcut, and after using it on an active Internet browser window, it will be closed each time it appears again. Qweas is providing links to Advanced Popup Killer 4.0 as a courtesy, and makes no representations regarding Advanced Popup Killer or any other applications or any information related thereto. Any questions, complaints or claims regarding this application Advanced Popup Killer 4.0 must be directed to the appropriate software vendor. You may click the publisher link of Advanced Popup Killer on the top of this page to get more details about the vendor.